For over three decades there has been a recognition that we are increasingly operating in a VUCA world. Coined by the U.S. military, VUCA signifies a world characterised by Volitility, Uncertainty, Complexity and Ambiguity (Johansen, 2007.) This is a world where life happens despite our best plans. Where the vast complexity and interconnectedness of our systems results in us not being able to predict outcomes as reliably as in the past. Whilst few would argue for the relevance of a scientific and analytic approach to management, business in a VUCA world requires more from managers. It requires managers to go beyond solving problems to exploring solutions to find ways in which dissolves, rather than solves problems (Dostal et al, 2005.) It requires that we can see through our customer’s eyes, grasp trends and identify opportunities that arise unexpectedly. Focus on human need: It might come as a surprise but empathy is a core competence in design (Liedtka & Ogilvie, 2011.) Demographics and statistics are not enough. For design to be effective, the process must be centred around people’s experiences and needs. You need to get into the hearts, minds and experiences of your users or customers. Treat dilemmas as opportunities: Exploring seemingly conflictual properties or forces in our businesses or environments fuels creativity. Paradoxical cognition, which involves simultaneously holding creativity and efficiency goal has been shown to increase output substantially (Miron-Spektor, Gino & Argote, 2011.) So next time you feel weighed down by a problem that you can’t solve, realise that this might be the dilemma needed to up your game! Separate brainstorming and evaluation: Effective brainstorming is built on the premise of encouraging the identification and incubation of a wide range of ideas before evaluating them (Osborn in Mongeau & Morr, 1999.) This suspension of judgement helps to free up thinking and reduce apprehension of individuals to put ideas on the table. Use prototyping to speed up innovation: Design thinking has a curious principle, “instead of thinking what to build, building in order to think” (Brown, 2009.) Prototyping not only helps speed up innovation, it gives insight through visualisation and feedback. Encourage collaboration and diversity: Recognised as a component of creating a high quality thinking environment, diversity creates value by allowing us to explicitly contrast perspectives (Kline, 2002.) Design thinking encourages engagement with stakeholders, as diverse a range as possible. 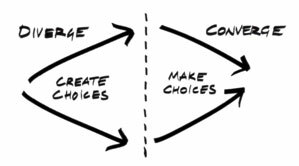 If “great design occurs at the intersection of constraint, contingency and possibility” (Buchanan in Liedtka & Ogilvie, 2011), the current business climate is clearly rich with possibility. Learning to deal with a VUCA world offers the potential for managers to not only become more resilient, but to mine the Volitility, Uncertainty, Complexity and Ambiguity for opportunities to create value and build business results. Maybe its time you consider design thinking as core to your management practice. Are you creating choices or just making them? Johansen, B. 2007. Get there early: Sensing the future to compete in the present. San Francisco, CA: Berrett-Koehler Publishers. Kline, N. 2002. Time to Think: Listening to Ignite the Human Mind. London: Hachette. Liedtka, J. & Ogilvie, T. 2011. Designing for growth: a design thinking toolkit for managers. Columbia University Press. Miron-Spektor, E, Gino, F. & Argote, L. 2011. Paradoxical frames: When thinking inside the box enhances individual and team creativity. Organisational behaviour and human performance, 116(2): 229-240. Mongeau, P. & Morr, M. 1999. Reconsidering brainstorming. Group facilitation: A research and applications journal, 1(1), winter.